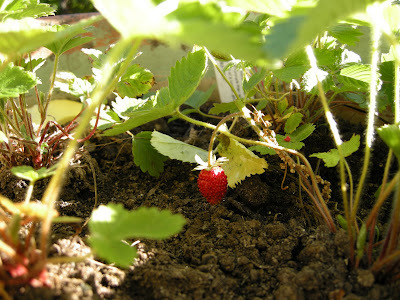 Not just any strawberry, mind you, but a certified organic, Alpine strawberry from our garden. Miraculously, the squirrels did not get their paws on it first. Instead I allowed Izzy to pluck it and seeing as it was too tiny to share, he had it all to himself. I hope the others ripen so I will have the chance to sample their sweetness myself. you know you love your kid when you give them a beautiful strawberry like that. i would do hte same. That Wasn't A Dinner Party, Was It? Macaroni And Cheese: Why Didn't It Please? Gummy Bears For SnacK? The very thought..
Did Someone Say Happy Mother's Day?